I'm not up to date with the newest burglar trends, but if I was a thief i don't think i would want to go around poking all the power outlets... not an efficient use of time! While this does not qualify as an "artful" storage solution, it is pretty smart. And now, as a burglar, I'll be sure to check the outlets. Good tip. 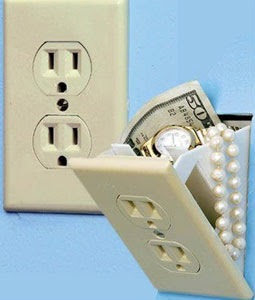 Apparently outlet hiding is common enough that burglars tend to look there first in some cases. I'd check out this article instead for better ideas. When something gets too common, thieves respond in kind and start keeping an eye out for it. Thanks for the tip, Crosberg.